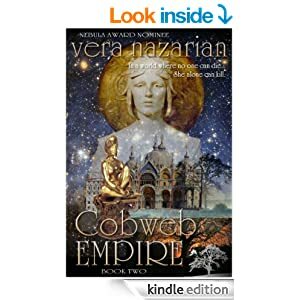 Vera Nazarian’s COBWEB BRIDE (reviewed in December) started the story of Persephone “Percy” Ayren, a commoner in an alternate world of 1700s nobility. Percy has an unusual ability: She can see the presence of death. And in a world where death is suspended and no one can truly die, her ability is both a blessing and a curse. During the course of COBWEB BRIDE, Percy met up with a number of interesting and influential people, including the newly-dead Infanta Claere Liguon (sole heir of her realm), the Witch woman Grial, the enigmatic Black Knight Beltain Chidair (son of the infamous Duke “Hoarfrost,” now dead and even more disreputable than he was in life), and many, many others, including Death Himself. All of the living people, though, paled in comparison to Percy due to Percy’s unusual abilities. When COBWEB BRIDE ended, Percy returned home, revealed herself as Death’s Champion and managed to ease her dying, suffering grandmother — who’d been “living” despite a death rattle for weeks, unable to eat, move, or possibly even think — into a true and peaceful death. This, of course, is a miracle of epic proportions under the circumstances. And it cannot be hidden for very long, especially as the various countries populating this alternate Earth (including Liguon, Lethe, Styx, Balmoe, Morphaea, and Serenoa, along with our “mundane” countries of France, Spain, and Italy) are at war. At the start of COBWEB EMPIRE, Percy is dealing with the aftermath of easing her grandmother’s transition into a clean, true death. She’s wondering why she, of all people, has this ability. And she wonders if it makes her more than human, or less? But she doesn’t have much time to spend on philosophical pursuits, as word spreads rapidly of her abilities, especially after she grants a suffering pig — which had been butchered before anyone figured out death no longer applied and has been in an undead, yet hurting state for weeks — its true death as well. The village priest is immediately called, and he says it’s a miracle (discreetly pocketing a few coins from Percy’s relieved father on the way out). So Percy continues on her way, as she needs to return the riding animal and cart to its proper owner, Grial the Witch woman. Of course, there are obstacles aplenty before Percy finds Grial, and one of those obstacles is the nature of these additional lands themselves. They have oddly started to fade, taking people and objects with them. No street or dwelling place is safe, and no one has any idea why it’s happening, either . . . the best guess is that because death itself is suspended, these particular “extra” realms are hurting because magic works there, whereas it doesn’t seem to be able to do so in France, Italy, and Spain. Once Grial is found, she gives Percy a few hints along with a good meal, introduces her to the Crown Prince and Princess of Lethe, who need Percy’s help in order to allow the Crown Prince’s mother, the Queen, to truly die. And because Percy has a big heart and cannot stand suffering, she does so . . . but that causes even more challenges. Consider, please, that Kings and Queens, if they have any sense at all, need to understand tactics. Since many of these countries are at war with one another, they need a tactical advantage. And what could be a greater advantage in a world where no one can die than a woman who actually can send the undead into a true death? Fortunately, Grial intervenes and sends Percy, along with the Black Knight Beltain Chidair, along their way again. Grial knows that Percy must continue to search for the true Cobweb Bride, as that’s the only way life as everyone knows it will ever return. Because all of the same problems discussed in COBWEB BRIDE still exist. People cannot grow anything, because the grains will not ripen. You cannot butcher any pigs, cows or other animals, because the meat will not cure. Even milk will not properly curdle, so making cheese and yogurt is out, and aside from water itself, there is nothing that will keep the populace from starvation unless Death gets his Cobweb Bride . . . and that in a hurry. At any rate, Beltain is a formidable knight, so between his fighting abilities and Percy’s rapidly improving abilities in sending the undead into true death, they are left unmolested (though with more than a few strong scares). But there’s more between them than just the comradeship of the road, as Percy had feelings for him in COBWEB BRIDE, while Beltain at least thought she was interesting and spunky. But the more he sees of her and her abilities, the more protective and loving he becomes. Mind you, a touch of love was very welcome here amidst all this death. And someone being able to love Percy for herself despite her unusual abilities — or perhaps because of them — was even more welcome. At any rate, there is yet another factor to consider. Rumalar Avalais, the Sovereign of the Domain (think of her as the equivalent of the Emperor and Empress of Liguon), has decided to take the field of war. And this Sovereign doesn’t seem to be keen on ruling the living . . . The pluses of COBWEB EMPIRE are many. Ms. Nazarian has an ability to give her characters just the right words to say; her characterization is top-notch, her storytelling is keen, and there’s a feeling despite all the darkness and death that somehow, someway, the world will be righted again. In other words, COBWEB EMPIRE, far from being a “filler” book as tends to happen in far too many trilogies as of late, has a good story to tell all its own. It comes out of the previous COBWEB BRIDE, deepening and broadening it immensely, then adds complexity upon complexity until there’s yet another major surprise in store at the end. Bottom line? COBWEB EMPIRE is a worthy sequel to the excellent COBWEB BRIDE that leaves much room for doubt as to what, exactly will happen in the concluding COBWEB FOREST. ** Note that if all goes well, COBWEB FOREST should be reviewed next weekend. Stay tuned. This entry was posted on March 2, 2014, 8:54 pm and is filed under Book Review. You can follow any responses to this entry through RSS 2.0. You can leave a response, or trackback from your own site.